How to manage spam messages (Linux)? Install SpamAssassin on the server. Go to Plesk > Tools & Settings > Spam Filter. Turn on the protection against spam on a server-wide level. For every email message that comes to the server, sender's and receiver's email addresses are recorded in a database. When a message comes for the first time, its sender and receiver addresses are not listed in the database yet, and the server temporarily rejects the message with an SMTP error code. If the mail is legitimate and the sending server is properly configured, it will try sending email again and the message will be accepted. If the message is sent by a spammer, then mail sending will not be retried: spammers usually send mail in bulk to thousands of recipients and do not bother with resending. Asllow users set their own spam filtering preferences on a per-mailbox basis. Set the maximum number of worker spamd processes to run (1-5). We recommend that you use the default value. By default, the filter sensitivity is set so that all messages that score 7 or more points are classified as spam. If users still receive spam messages with the default sensitivity, increase it by setting a lesser value, for example, 6. If SpamAssassin marks valid messages as spam, decrease the sensitivity by setting a higher value, e.g. 8. Turn on using the SpamAssassin on this mailbox. If it is not required to modify messages subject, leave this box blank. 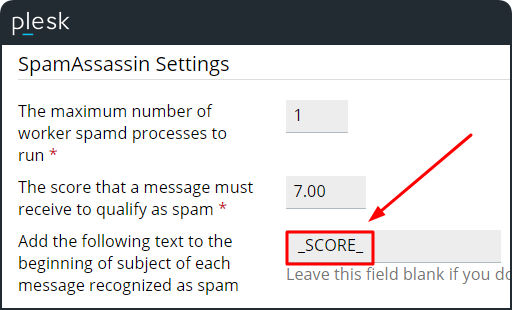 If it is required to include into the subject line the number of points that messages score, type _SCORE_ in this box. Spam messages will be deleted from the mailbox. Move all spam messages to the folder called Spam. This folder is accessible from your mail client program or webmail. If an IMAP mail account is used, the Spam folder can be used for training the spam filter. Email messages coming from senders in the white list are not checked by the spam filter. Email messages coming from senders in the black list are blocked. Hello @Kironet, could you specify, do you have SpamAssassin installed? What version of Plesk and OS do you use? How to set "Move to SPAM folder" as default option for all inbox/domains? This functionality is yet to be implemented in Plesk. Please refer to this article for the workaround. [How to] Manage spam filter settings for multiple email accounts in Plesk for Linux? How to add new programs to a chrooted shell environment template?